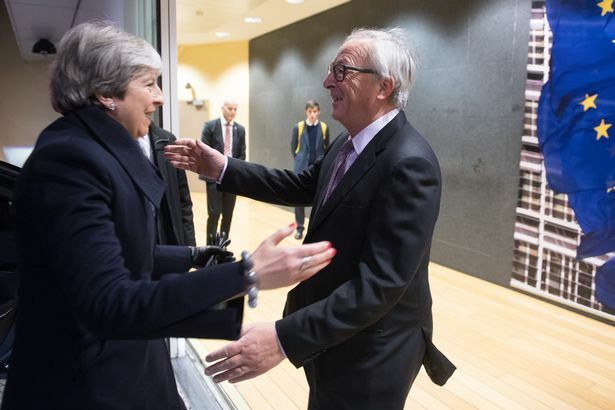 Theresa May meets Jean-Claude Juncker for their early-morning meeting. She’s smiling because she thinks she’s found a way to hoodwink us all into believing she has achieved something solid when all she has done is kick the Brexit can down the road. Am I wrong? Let’s consider. And here’s what analysts are saying. There will be no hard border, but Northern Ireland will get unfettered access to the internal UK market – even though the UK is leaving the EU’s single market and customs union. Even if an overall UK-EU deal does not secure NI’s status without special treatment, the plan now offers NI “full alignment” with some current EU rules it shares with the Republic – possibly including some aspects of the Customs Union as mentioned above. Won’t this simply scupper talks further down the line? And what about NI’s obligations under UK law? “And Irish Premier Leo Varadkar said Northern Ireland citizens can continue to “exercise his or her right” to EU citizenship” – further complicating matters as not every NI citizen is going to do that. On the financial settlement – often known as the ‘divorce bill’, Theresa May wants you to think she has beaten back the EU, and the UK will not pay any more than it must, meaning more cash for domestic concerns like “housing, schools and the NHS”. But she won’t be devoting £350 million a week to those concerns, as Leave campaigners offered in the run-up to the referendum, so UK citizens should rightly feel short-changed. And the wording of the financial settlement is opaque to the point of impenetrability. It states: “The second phase of the negotiations will address the practical modalities for implementing the agreed methodology and the schedule of payments.” In other words, everyone’s kicked the can down the road. “The financial settlement itself will be drawn up and paid in Euros – meaning Britain will lose out because the pound plummeted on referendum night. “Britain will have to pay its share of budget commitments “outstanding at 31 December 2020”. “It will take 12 YEARS [for the UK] to be repaid the huge pot Britain has in the European Investment Bank. The sums will be repaid in instalments of 300 million Euros a year. “Britain will honour commitments it made before 2019 for refugees in Turkey. Is this really a good financial deal? It looks like a fudge to This Writer. All right, then – what about citizens’ rights? It seems that Mrs May has given in to the EU on most of the details – although the announcement that this is a reciprocal deal, meaning everything that applies to the UK will also apply to EU citizens, is a bit of a breakthrough for the minority prime minister. Brextremists will hate the agreement that, although the European Court of Justice will not have direct jurisdiction over citizenship cases, UK courts must continue to give “due regard” to its decisions – indefinitely. Not only that, but UK courts will have to refer questions of interpretation (of the rules) to the ECJ for no less than eight years after Brexit. The Conservative government wants us to believe the agreement is entirely voluntary and will only apply to two or three cases a year. We’ll see. EU citizens will be able to move here at any time up to the date of Brexit (March 29, 2019), and their rights will be protected under today’s agreement. “Mrs May’s plan to force EU citizens to apply for “settled status” appears to be intact – she wanted to let people apply after they’ve been in Britain for five years. But the arrangements must be “transparent, smooth and streamlined”, the deal says. “People who’ve settled in Britain can now leave for up to five years without losing their settlement rights. Theresa May wanted it to be just two years. “Residence documents must be issued either free of charge, or no more expensive than similar documents would be for UK nationals. A “proportionate approach” will be taken to those who “miss the deadline with good reason”. “People who already have UK residence documents issued under EU law must have them converted to the new status free of charge – with only a security and background check. “Benefits and healthcare arrangements will continue as they are now for people living in a country under the agreement before 29 March 2019. Is that really “securing” everybody’s “rights”? Or is it simply doing as we’re told by the EU negotiators? This means nothing has been delivered at all. Everything that has been agreed so far could be thrown away if future stages of Brexit negotiations run into difficulty or unravel altogether. I am not celebrating May’s Brussels Deal. A) We don’t know what it is B) It’s a colossal waste of money C) I don’t know Parliament will agree it D) It means we leave the customs union E) It sounds like a Norwegian deal, only worse. So, F) It’s the enfeebling of the UK. Complete Capitulation – UK-EU joint report: "In the absence of agreed solutions, the United Kingdom will maintain FULL ALIGNMENT with those rules of the Internal Market and the Customs Union which, now or in the future, support North-South cooperation." To This Writer, it seems we’re being sold a pup. The details of the Irish border agreement have been delayed, as has the final agreement on the financial settlement, despite the fact that we were all told these must be finalised before negotiations move on to trading deals. And the deal on citizens’ rights seems to be everything the EU could want it to be, while ‘Leave’ voters will feel that they have been left out in the cold. But all the negotiating parties seem happy to let this non-deal stand. I wonder what Parliament will do with it, let alone what the representatives of the EU’s 27 remaining states will think, when they discuss it on December 14. So, with an open border at NI, we can expect to see every TD & H entering the rest of the UK unchallenged? As the UK will have to abide by the rules of the single market and customs union, does that include financial contributions? If it does, May has written a blank cheque because the agreed divorce bill continues to climb until we find a solution to the ‘catch 22’ problem of Northern Ireland that has so far proved impossible to solve. So, in summary, this breakthrough deal is that (until we find the answer to catch 22) the UK continues to abide by current and future rules of the EU without having any say in what they might be, and we pay an undisclosed and escalating divorce bill of tens of billions of pounds for the privalidge. That’s what I call taking back control!